Looks like a remarkable place; and a slightly crazy way of getting around ! I thing your photos are great! For me, it's an inexpensive way to see Alaska. Beautiful scenery, Jill. I could almost imagine myself being there, then I remember that white stuff only exists where it's *cold*. Last week I pulled out my winter gear, long-sleeve shirt, long-fingered gloves, because it was cold here. About as cold as it gets here anyway, 50 degrees. Just few thousand miles South of you, in the Valle of the Sun (Phoenix). Great shots, Jill. My Pugsley is having snow envy. We have a forecast for today for snow showers and 50 mph wind gusts. So maybe mine will see some early snow!! I agree with Doug on the photos. 30-40 mph winds right now with higher gusts. We even have a wind chill today. Just took the dog for a walk in some snow flurries. Yeh! Time to head for the trails and some mtn. biking. I just discovered your blog (through a circuitous websurfing route), and wanted to say Thanks for bringing back fond memories of Alaska. I spent eight great years in Sitka, and I still have many friends in Juneau. I just started my own blog, and I will definitely link to yours! 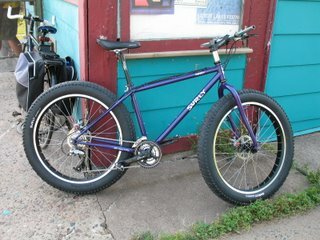 I am not an avid biker, having just started riding mountain bikes in New Mexico, but hopefully one day...who knows? oh, sigh. that snow looks wonderful. have a blast, pugsley. hey what kind of tires are you using? do you use studs? i live in seattle and we are getting the first of your snow. Beautiful pic. I liked how you revisited that tree. The contrast is remarkable.